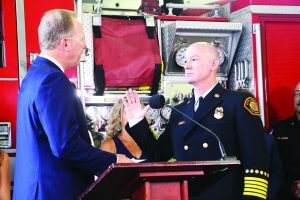 With a brief pause of the celebratory ceremony – because firefighters at station one had to respond to a call – Colin Stowell was sworn in on Monday, Aug. 13, as the 18th Chief of the San Diego Fire-Rescue Department. Stowell, a native San Diegan, was sworn in by Mayor Kevin Faulconer who appointed him as the next chief of the department last month. Stowell was one of 33 candidates for the position and was selected after a three-month national search. The chief hopes to ensure that under his leadership, the department will have advanced equipment, best trained personnel, and to increase partnerships with other agencies. Stowell has also expressed interest in working with communities and toward a more diverse department. “I am humbled and honored to be named the 18th Fire Chief with San Diego Fire-Rescue Department, and do not take lightly the trust that city leaders, elected officials, and the members of this organization have in me to lead the way. As Fire Chief, I recognize the critical importance of continuing to provide compassionate and professional emergency services that distinguish this department, and ones that citizens and visitors to our city both deserve and expect,” Stowell said in the release. He will be responsible for more than 1,200 firefighters, lifeguards and staff in the department. Stowell will take over the department where he held various leadership positions like deputy chief and assistant fire chief. He previously served as the chief of Heartland Fire and Rescue, which serves the cities of El Cajon, La Mesa, and Lemon Grove. Faulconer added that Chief Stowell has a big job ahead of with with wildfire season being year-round and with his crews at the front lines of the homelessness crisis, but the Mayor said that Stowell is ready for the challenges. 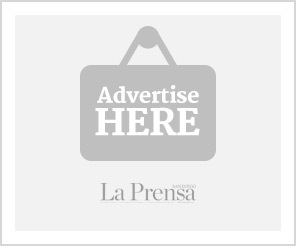 The San Diego City Council approved the appointment of Stowell on Monday, July 23, and the council members expressed their support and belief in the skills and experience he will bring to the position. “With fire season a year-round reality now, I feel confident that under the leadership of Chief Stowell our fire rescue department will continue to deliver the very best services for San Diegans,” City Councilmember Lorie Zapf said in the release.